Q: What kind of group program does CCSC run? A: The Cape Cod Sea Camps offers accommodations (housing) and meals only. The program or schedule that the group follows is designed and implemented by the group leaders. Certainly, the CCSC staff has many years of experience to help plan a program and has lots of resources to offer as well, but we do not offer a group program. Q: What’s included in the basic lodging rate? A: Included in the basic rate is use of all our facilities – designated meeting spaces, fields, tennis courts, basketball courts, and cabins. We have a “sports area” near the main office that has a sign out sheet with limited sports equipment you are welcome to borrow. We do not include use of camp equipment, such as boats. A: Our dining hall can provide 3 meals daily on campus as well as box lunches for groups to take with them on excursions. Groups are not required to purchase any meal or meal plan. The meal plan is designed around the group’s needs and individual schedule. Menus, special dietary needs (ie. vegetarians, allergies, etc. ), and logistics of how to get the group in to the dining hall, rules and regulations for the dining hall use, meal times and more can be discussed in depth with the CCSC Staff during the reservation process. Q: What if someone in my group has a food allergy or special diet need? A: We often cater to individuals who have food allergies as long as we have been given specific information in advance. In order for us to have the proper foods we ask that either the individual directly contacts the CCSC Group Director or the Leader contacts us with the required information about the allergy. We do have a specific section on our “Confirmation Form” that asks for this information. Due to recent nut allergy concerns, Cape Cod Sea Camps strives to provide a “nut free” environment in our kitchen and we screen and do not prepare any foods that affect those allergic to nuts. Q: Who do I contact if I have a problem while I am staying at the camp? A: When you check in to Cape Cod Sea Camps you will meet your “Group Host,” this is the best person to coordinate with during your stay. The best times to get in touch with this person are at meal times, but you will see them around camp often. Usually, there is a group host on duty from 7am – 10pm. You can also refer to our main office. The office is generally open 7 days a week during the group season from 9am – 4:30pm. Q: Is there swimming and boating offered? A: Cape Cod Sea Camps does not offer the use of the camp’s boats for groups and we do not allow the launching of personal watercraft from our property. However, groups may bring their own personal kayaks and canoes and launch from a local town landing, there are several close by. Swimming is only allowed at the camp when a group has a fully certified lifeguard and has informed the Cape Cod Sea Camps. We will arrange to have a lifeguard present who understands our CCSC emergency protocols, the environment and the correct coverage. Please refer to our Forms page for our waterfront permission slip that is required also. A: The accommodation charge includes a bed that has a sheet-covered mattress and a pillowcase-covered pillow. Linens can be provided from CCSC for a small fee and need to be planned for in advance. If you choose to bring your own bedding, sleeping bags, towels, and toiletries are recommended. Q: What are the check in/check out times? A: Scheduled cabin check in time is 3pm and departure is by 10am for cleaning purposes. Certainly, special arrangements can be made with the Group Coordinators when planning your trip. Q: What if we arrive early/late? A: If you are going to be arriving at camp early, please contact the Group Host to see if your cabins are available to check in to. If you are arriving late, just let us know and we will have someone available to meet your group or will make arrangements to leave your information at the office. Q: Do you have a laundry or cleaning service? A: Our laundry service is only available to wash Cape Cod Sea Camps linens that we provide during your stay. If you need cleaning supplies or help with your cabins, you can ask the CCSC Staff. All cabins are equipped with plungers, a bucket and mop, and some cleaning supplies. We ask that you clean the cabin you are staying in and leave it in the condition you found it after your stay is finished. Our departure cleaning procedures are posted and included in the Leader packets. A: Adult group leaders are responsible for their participants “24/7″ including supervision in the cabins with the children. 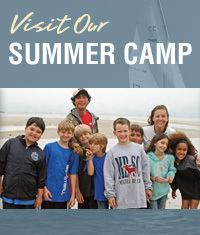 Cape Cod Sea Camps recommends the guidelines suggested by the ACA (American Camping Association) for all groups that include children. Please ask the Group Director for more information. Q: What if a member needs medical help? A: A group that is staying at the Cape Cod Sea Camps is responsible for their own medical issues. The group is encouraged to bring a staff member who is trained in CPR and First Aid in case of emergency and it is recommended that you bring your own first aid supplies. In severe cases of emergency, the Group Host can aid in calling the Brewster Rescue Squad – 911. Each group packet of information has directions to Cape Cod Hospital and the Fontaine Medical Center in Harwich. Q: Where can I park? Can I drive to the cabins? A: Parking is in front of the “Big House,” (office) and along the western side of the entrance to camp. Group Leaders may have one car by their cabin areas for emergency use. You may drive to the cabins in order to unload luggage and equipment, but need to park near the office when finished. CCSC wants to remain a rustic camp experience and as safe as possible; that means as few cars as possible! A: Yes, you may have a campfire in the designated campfire areas; which are the counselor rings next to cabins. All campfires need to be approved by the Group Host and you must have a full bucket of water to put out the fire. A: Office hours during the group season are generally Monday – Sunday from 9am – 4:30pm. Q: When is the camp store open? A: The camp store is open at the request of your group, please confirm with a CCSC Staff when you would like it open. You can buy snacks and Cape Cod Sea Camps souvenirs here. The camp store is located right behind the dining hall. Q: How many people is the required minimum for a stay? A: 20 people is the minimum number of people that we charge for. You can certainly book a group of less than 20, but know that you will be charged for a minimum of 20 people. Q: How many people can the Camp accommodate? A: We have had groups with more than 900 people on campus and as small as 20 people. The maximum number of beds we have available is roughly 700 and the dining hall can seat roughly 360 people at a time for meals. Q: Is there a quiet time at night? A: We ask that all our guests respect our neighbors and other groups that might be staying on campus. Our “quiet time” is before 7am and after 10pm. Q: What utilities do each of the cabins have? A: All our cabins, dorms, and cottages have electricity, lights, smoke detectors, carbon monoxide detectors (where appropriate), some of our cabins have heat and showers, and most of our cabins have attached bathrooms with toilets and sinks. Our dorms have a small kitchenette and most have private bathrooms and showers. For a more complete listing of what each cabin has, please refer to our lodging section. Q: Do you host corporate functions or single day events? A: Yes, we offer our campus to be used for single day events. We have held many rehearsal dinners, private company outings and birthdays. Cape Cod Sea Camps can cater your event and allow the use of our various meeting spaces, or recreational areas. Please refer to our Single Events section for rates and information.